The capital city of Rajasthan, Jaipur, is famous for its forts and palaces. Founded by Jai Singh II, it is called the Pink City of India, since Maharaja Ram Singh had painted the entire city pink during Queen Victoria's arrival in 1876. He believed pink was the colour of warmth and friendliness. This popular tourist destination is part of India's Golden Triangle of tourism, the other two being Delhi and Agra. Apart from the many monuments, Jaipur is home to a few beautiful temples that are definitely worth a visit. Read about the 5 temples in Jaipur that you mustn't miss. While India has many Birla temples spread across the country, the one in Jaipur is one of the most prominent ones. 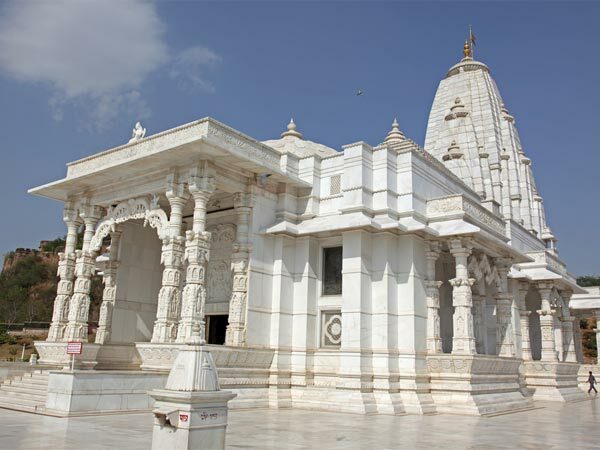 Sometimes it is also referred to as Laxmi Narayan Temple. Built by the Birla family in 1988, the temple is dedicated to Lord Ganesha and Goddess Laxmi. It is made completely of best-quality white marble and has three domes representing the three different religions of India. The best time to visit Birla Mandir is during the Krishna Janmashtami, the festival that is celebrated here with utmost grandeur. The temple remains open from 8 am to 12 pm and 4 pm to 8 pm everyday. Govind Dev Ji is one of the many alternative forms of Lord Shiva. Like the name suggests, it is dedicated to Govind Dev Ji. The temple was built by Maharaja Pratap Sawai Singh II, in the year 1735. It is popularly believed that the idol of the temple was made by Vajranabha, grandson of Lord Krishna. The idol is believed to have been brought from Vrindavan by the founder of Jaipur, Raja Sawai Jai Singh II. The temple remains open from 4.30 am to 11.30 am and 5.45 pm to 9.30 pm. Located about 10 km from Jaipur is the Galtaji Temple, dedicated to Lord Hanuman. It is often referred to as Monkey Temple as well, due to the presence of many monkeys in and around the temple. It has a natural spring flowing in the temple which originates from a hilltop. Since it is settled on the Aravalli ranges, the Galtaji Temple offers a brilliant, panoramic view of the entire Jaipur city. The temple is also surrounded by lush greenery to add to the beauty. The temple remains open throughout the day. Shila Devi Temple is dedicated to Shila Devi and is located in the magnificent Amber Fort. The idol of this temple was found in the form of a Shila or stone slab by the sea and therefore, got the name Shila Devi. Back in the day, it was washed and brought to the fort where it was installed. Building the temple extended for 10 years and now, the temple has beautifully adorned silver doors. Thousands of devotees crowd the temple, particularly during Navratri. This ancient temple is dedicated to Lord Ganesh and is settled on the hills near the popular and splendid forts of Nahargarh and Jaigarh. Ganesh Chaturthi and Diwali are the two festivals that are celebrated in the most boisterous way here. The idol of Ganesha here is the child version of him. Maharaja Sawai Jai Singh was the architect of the temple and he built it when he performed the Aswamedha Yaga.